Elizabeth said "I have no desire to make windows into mens' souls". 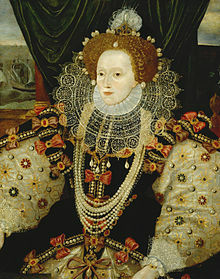 Her desire to moderate the religious persecutions of previous Tudor reigns — the persecution of Catholics under Edward VI, and of Protestants under Mary I — appears to have had a moderating effect on English society. Elizabeth, Protestant, but undogmatic one, Christopher Haigh, English Reformations, Religion, Politics and Society under the Tudors, 1993 p. 237 ISBN 978-0-19-822162-3, reinstated the 1552 Book of Common Prayer with modifications which made clear that the Church of England believed in the (spiritual) Real Presence of Christ in the Holy Communion but without a definition how in favor of leaving this a mystery, and she had the Black Rubric removed from the Articles of Faith: this had allowed kneeling to receive communion without implying that by doing so it meant the real and essential presence of Christ in the bread and wine: she believed it so. She was not able to get an unmarried clergy or the Protestant Holy Communion celebrated to look like a Mass, Haigh, op. cit. p. 241. The Apostolic Succession was maintained, the institution of the church continued without a break (with 98% of the clergy remaining at their posts) and the attempt to ban music in church was defeated. The Injunctions of 1571 forbade any doctrines that did not conform to the teaching of the Church Fathers and the Catholic Bishops. The Queen's hostility to strict Calvinistic doctrines blocked the Radicals. Almost no original theological thought came out of the English Reformation: instead the Church relied on the Catholic Consensus of the first Four Ecumenical Councils. The preservation of many Catholic doctrines and practices was the cuckoos nest that eventually resulted in the formation of the Via Media during the 17th century, Diarmaid MacCullough, The Later Reformation in England, 1547-1603, 2001, pp.��24–29 ISBN 0-333-69331-0, 'The cuckoo in the nest,' p. 64, 78-86; English Reformations, Religion, Politics and Society under the Tudors, 1993, pp. 240–242, 29-295. She spent the rest of her reign ferociously fending of radical reformers and Roman Catholics who wanted to modify the Settlement of Church affairs: The Church of England was Protestant, "with its peculiar arrested development in Protestant terms, and the ghost which it harboured of an older world of Catholic traditions and devotional practice," MacCullough, p. 85. ^ Cooke, Alan (1979) . "Frobisher, Sir Martin". In Brown, George Williams (ed.). Dictionary of Canadian Biography. I (1000–1700) (online ed.). University of Toronto Press. ^ a b "Life In Tudor Times". Localhistories.org. Retrieved 10 August 2010. ^ "Spread of the Plague". Bbc.co.uk. 29 August 2002. Retrieved 10 August 2010.